There is that faint smell of summer in the air which means December is fast approaching. Yes, we agree that it is too soon for Christmas decorations in your local mall but let’s face it, from a marketing perspective, this is the last quarter of the year and a very important one for those in the retail sector. High inflation, high cost of living and price competitiveness are all factors which could prevent retailers from making a profit but these negative factors are also encouraging businesses to focus their marketing efforts to gain new customers and also retain them. Using an online marketing strategy will help bring traffic to your website and for those who sell products online; this is critical. For retailers who have a brick and mortar store, driving traffic to your website will bring about brand awareness which will eventually lead to new customers. Let’s be clear that each business is unique and therefore a marketing strategy is dependent on so many factors; these are just a few simple tips to try and include in this last quarter of 2014. Analysing your competitors is key, this doesn’t necessarily mean having to undercut their pricing but rather looking at how your offering could be better or more interesting. In the run up to the Christmas buying spree, create an offer that sets yourselves apart from the other retailers. It could be something fun like a free gift with any purchase over R300 or offer a free gift wrapping service. This can be done in store or from your online store. There are also ways to review your competitors online by looking for your key products on www.google.co.za and this will reveal who your competitors are (if you didn’t know) and also what they are offering. Spending money is always met with some cynicism; but small budgets can achieve big results if spent wisely. A good start is a small AdWords campaign with Google which can be used to drive targeted traffic to your website. 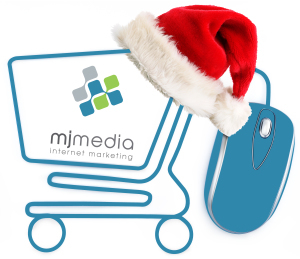 The important factor for the festive season is getting in sales and this can be monitored through your AdWords campaign. For ecommerce stores; there are some excellent tools and tracking measures in Google analytics which will help your business analyse how customers are engaging with your website and how much they are spending. Set aside some budget to spend on social media, too. Facebook is the most popular social media platform in SA at the moment so this could be a smart investment and advertising can be targeted by location, age, gender or interests. Social media is big; bigger than you might think. In 2013; Facebook had 9.3 million users in South Africa, Twitter had 5.5 million and Youtube 4.7 million. Find a social media audience that suits your products and start to build a community. It may sound like a lot of work, and it is, but this is one of the best marketing channels to get in front of a wide audience. We suggest creating a monthly content strategy for your social media marketing which can incorporate new products; tips; blogs; articles or upcoming events. Encourage engagement with your fans or followers so it isn’t wise to bombard them with sales messages 12 times a day. Once this is mapped out, the daily maintenance of social media becomes more manageable. Invest in mobile. The internet speed and cost is improving albeit at a slower rate than many of us would like but this means that more people are searching the web from their mobile devices than ever before. This figure is set to increase rapidly so it is important that your website is built responsively. All this means is that potential customers can view your website correctly on many different devices. We recommend getting the help of a web developer who can help test the usability on a range of smart phones and tablets. These tips will hopefully bring about some good sales for 2014 Q4 but they are also solid investments for your marketing strategy for 2015. Let us know if you have any questions on info@mjmedia.co.za or visit our website on www.mjmedia.co.za. Happy selling! Facebook Business Pages: How They Work? Over the past 5 years, MJ Media have fine-tuned our online marketing platforms, improved our Google presence and increased our website visits and enquiries. The end result, leading to greater brand awareness and a growing business. It’s been an exciting journey! Bridgette and Giselle have managed our Adwords account for over 12 months and have always provided excellent and efficient service with a flexible and proactive approach. We are very pleased at the results obtained so far and look forward to continuing our successful relationship with MJ Media. We would recommend MJ Media to any organisation seeking to outsource some or all its internet marketing requirements to a trustworthy and transparent supplier. MJ Media have been amazing since day one, they listen, they are patient and they give advice which is always the best, they are helping me grow my business. I have seen increased quote requests from our web site. MJ Media’s work on internet marketing has made a significant difference to my business. I appreciate the hard work that they put on our marketing and look forward to continuously working with them. Vet Products Online has been operating effectively for 12 years, but this year I thought it was time to progress to the next step of online marketing and social networking. MJ Media was recommended to me to assist and manage Facebook and Google marketing. Bridgette and Giselle are two stars in their field, both professional and enthusiastic. Their support is reliable and their turn around time to requests, queries or project needs is speedy. We have certainly benefited positively from MJ Media input and I highly recommend them to other companies who have internet marketing requirements. Bridgette and Giselle have been our online partners for about 4 years now. Flexible Workspace sells office space and related services in the B2B market and as the founder not only am I convinced that Online is the most effective channel for our offering but that MJ are the right service provider for us. Being a relatively small (but growing) business, we need to be nimble and they in turn need to be ready and geared to move with us – MJ gets this. Having access to the decision maker/driver of the business is also important to me – they have a personal touch that larger agencies are unable to replicate. Finally, and most importantly they produce results – from the time MJ took over our account they have increased our lead flow 5-fold. As a business owner this is all I’m interested in – lead generation and conversion – this is the real measure of Return on Investment and they have delivered in spades.